"The video shoot was awesome! We got to work with Greyson for like 3 hours! He's so cool and cute!" Xbox will ask the first Question: At 12-years-old, you are a few years away from a legal driver license, but are you looking forward to playing the driving game Joy Ride for Kinect? Yes! The game looks awesome, and what I find great is that I can play with a lot of different people when I play! Do you love all your fans??? I love my fans SO MUCH! They are the reason why I am here today. I am so blessed and thank you so much for your support! Love you! u friends with Justin Bieber? How has Canada treated you? Going to Canada was my first time out of America and it was awesome, I enjoyed so much. My fans there are so kind and welcoming. I thank all my Canadians so much! what do u do on your free time? My favorite movie of all time would be Goodfellas! When does your new album come out? I have been singing since I can remember! My sister and I used to perform duets in front of my mom...that's when I started taking music very seriously. Mexican food is my all time favorite! Hey Greyson(: It's Jessica, you tweeted me on Friday! Thanks for that:) Just wondering, if you could do a duet with anyone you wanted to (alive or dead) who would it be? Love youuu! If I could collaborate with anyone it would be Lady Gaga. Her voice and records are such pieces of art, and Gaga changed my life. If she hadn't written \"Paparazzi\" then I would not be in the same situation today! How long have you been a fan and gamer of the XBOX Live community? I have been playing XBOX since I got one as a gift for Christmas last year. I love playing my XBOX when I get home! How do you balance your "normal" life from your "celebrity" life? Sometimes it's difficult - I miss Edmond, OK (my hometown) and I miss my friends and family, but in the end I am doing what I love! did u celebrate haloween ?? and if u did what did u dress as ?? Yes I did, I was a man riding an inflatable Ostrich! Do you have a fan mail address? Yes! Fan mail can go to: Greyson Chance care of Interscope Geffen A&M Records, 2220 Colorado Avenue, Santa Monica, CA 90404.
what game are you most looking forward to play on the kinect? I looking forward to the Harry Potter and the Deathly Hallows game! I love Harry Potter!!!!!!!!! If you could instantly become fluent in another language, which language would you pick? I have always wanted to be fluent in French. I think their language is such a piece of art and I like the way it sounds! when you visit your friends from your hometown do they still treat you the same? Yes they all treat me the same. They are so supportive and help keep me down to earth! Greyson how do you like living in Los Angeles, compared to Edmond? I love the big city life of LA but in some cases I do miss the empty fields and the country life of Edmond. What is your next move in your life? The next step? The next move is finishing my debut album! I'm also shooting a video for my new song \"Waiting Outside the Lines\" this week! I\'m soooo excited! What Xbox games you have? My favorite XBOX game is probably NCAA Football! I love me some College Football! You are so close with your siblings, are you missing them while you're away so much now?? I am very close to my siblings, and I do miss them a lot. I am always on the phone or Skype with them so we stay connected! what was it like the FIRST time you met Ellen? It was a great experience that I will always remember! She is such an incredible and genuine person, and I am so thankful for her! What was your 1st reaction when you heard Ellen wanted to sign you to ElevenEleven records? Do not let anybody get in the way of your dreams! Just focus and follow them forever! 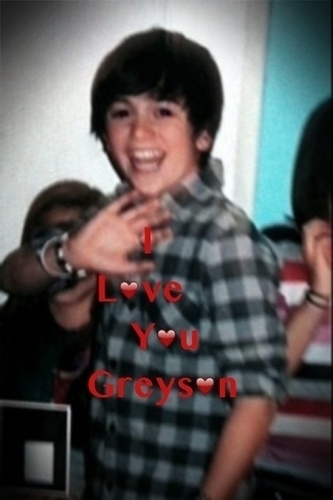 Hi Greyson! Who's your greatest inspiration as an artist? I would definitely love to come to Arizona! Hopefully I will be there soon! when you posted your video did you think this could happen? Unfortunately this is my last question, thank you so much for logging on to chat with me!